Reviewers have commented on the quiet interior of the 2017 Chrysler Pacifica minivans, and have praised its combination of ride and handling. According to FCA US engineer Jeff Tibbenham, it’s a matter of rings. As the engineer in charge of body structure, Mr. Tibbenham said that deflection — the twisting of the car body by rough roads — leads to squeaks and rattles, which have a major impact on owner satisfaction. 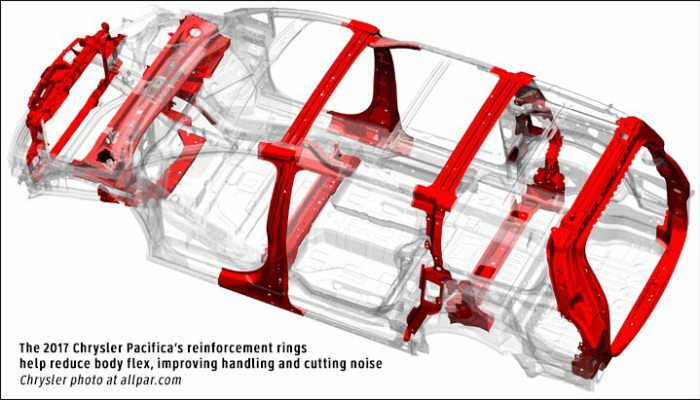 To fix that, Chrysler placed five reinforcement rings around the Pacifica (see the illustration). “These rings work together to minimize the effects of deflection caused by uneven roads,” said Mr. Tibbenahm at a recent conference. The added torsional stiffness also helps in cornering. The market seems to be responding; the Pacifica commands higher transaction prices than the outgoing Town & Country did, and has shot up to the #2 sales spot though supplies of the new minivan may still be limited in some areas, and the “base model” slot is handled by the Dodge Caravan. Trusted source Moparian sent the starting prices for the 2017 Chrysler Pacifica to Allpar, and they seem to be in line with current Chrysler minivans, though above the stripped-down Dodges. Bargain hunters can keep getting Caravans for another year, at least. By comparison, the Town & Country LX starts at $29,995, with the Town & Country Limited Platinum topping the range at $40,645. The Pacifica Limited Platinum contains more content, in addition to having a much more advanced suspension, upgraded seats, and a new suspension with a nine-speed automatic. Thus, there does not seem to be a true price increase to move from the old minivans to the new ones, looking at comparable models and ignoring incentives. Over at Dodge, the Caravan starts at $22,095 for the American Value Package, with the more popular SXT starting at $27,795. The Windsor, Ontario plant that builds all Chrysler and Dodge minivans is currently down for a thorough refitting, which will clear out ancient equipment and presumably use all available space when the minivan line is complete: standard, plug-in hybrid, and crossover (some believe a large car will also be added, as the Volkswagen Touareg shared with the Volkswagen Phaeton). In the meantime, Chrysler appears to still be running prototypes built in their Auburn Hills shop, anticipating the time when real pilots can run down the Windsor lines for a few months for testing before the all-important vans are made. Chrysler, inventor of the modern minivan, is still the sales leader for the first four months of 2015, but it has increasingly relied on cheap versions, discounts, and fleet sales, while Toyota and Honda cherry-pick the high-end sales. The new version will, according to Sergio Marchionne, have a fully independent suspension, an all wheel drive option, and a plug-in hybrid option, and is extremely likely to have a crossover relation. Naming has not yet been announced, but many observers expect that we will see a Chrysler Caravan with a high-end Town & Country trim level, duplicating the current lineup but without diluting Dodge’s new muscle-car image. Allpar now believes that the minivan will use the Chrysler 200 V6 nine-speed powertrain, with some rumors claiming there will also be a turbo four (possibly with the hybrid, so there is always torque available). The minivan is reportedly based on a stretched CUSW platform, and should start at $26,000 with lower or no rebates. We expect the exterior dimensions to remain about the same. Chrysler has revealed the 2015 300, 300S, and 300C, the company’s flagship cars (even if their prices are equalled by their own minivans). All 300s get an eight-speed automatic, but none get the 6.4 liter engine used in the past 300C SRT, unless a future un-announced model will have it. All wheel drive is restricted to the V6 cars. The cars continue into 2015 with relatively minor cosmetic changes: the front is more curvaceous, the side line emphasized a little, the grilles updated, a 200-like lower grille added, and the tail-lights simplified. Inside, the same basic forms continue, but with noticeably different styling. For many more photos, including interior and exterior shots, along with pricing and other information, see our 2015 Chrysler 300 – 300C – 300S page. When trying to decide which restaurant to eat at or which new TV to buy, the best reviews tend to come from people who have actually been there or experienced it. Sometimes it boils down to one simple question, would you buy it again? Feedback is in from owners of the Chrysler Town & County, and it ranked highest among minivans for the third time in four years in the J.D. Power 2014 U.S. Initial Quality Study (IQS). The IQS is based on responses from more than 86,000 owners of 2014 model-year vehicles after 90 days of ownership. The study asks customers to identify issues with their vehicles’ design, as well defects. The Chrysler Group’s ultimate family vehicle, the Chrysler Town & County, was significantly updated for the 2011 model year and previously achieved the highest ranking among minivans in 2011 and 2013. The Dodge Challenger also ranked at the top of the Midsize Sporty Car segment for initial quality in the same survey. The Challenger was updated for the 2011 model year and also led its segment for initial quality that year. The 2014 Ram 1500 and Dodge Grand Caravan also performed well in the study, ranking among the top three vehicles in the Large Light Duty Pickup and Minivan segments, respectively. The IQS study, now in its 28th year, is based on a 233-question survey conducted between February and May 2014.